With the " Savoury Range", I can tailor-make a selection of items to suit your function. They are designed to cover a variety of situations, such as work morning teas, a lunch, drinks party or even just for you to enjoy at home. I am able to make any combination of items from my website for your function. Plating on platters is available or I am more than happy to use your platters and to cut and arrange the items for you. There is a small charge for the use of my platters and for plating. Delivery is by arrangement and dependent on location. It is advisable to book in advance as to avoid disappointment. Please get in touch with Angie to arrange the specific requirements of your occasion. ​​Main ingredients: Wholemeal or white sandwich loaf, margarine, champagne ham, egg, mayonnaise, curry powder, salt, pepper, lettuce, Dijon mustard. Main ingredients: Wholemeal or white sandwich loaf, margarine, cooked chicken, mayonnaise, chives, Salt, pepper and cucumber. 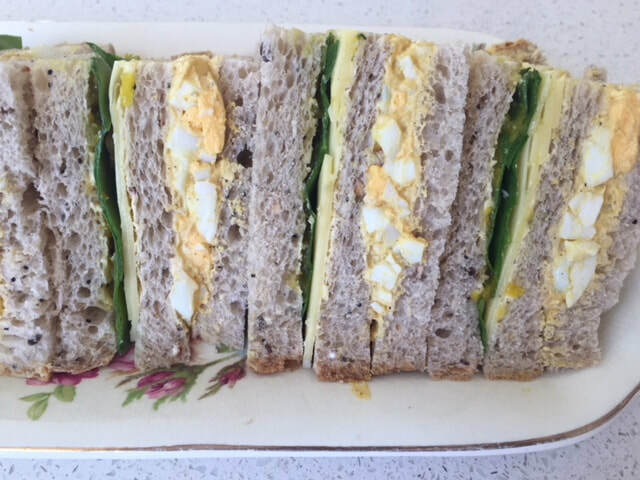 ​Main ingredients: Wholemeal or white sandwich loaf, margarine, egg, mayonnaise, curry powder, salt, pepper, fresh, spinach leaves, tasty cheddar cheese and zucchini pickle. ​I use either wholemeal or white sandwich bread. 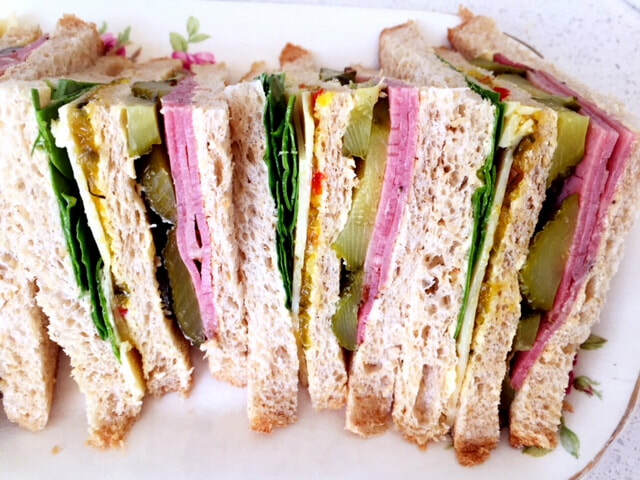 The sandwiches have three slices of sandwich bread which are generously filled and cut into triangles. You may choose to have the crusts on or cut off. We can also offer to cut the Club Sandwiches into finger slices. The cost per finger is $3.30 per finger slice. This iconic mixture of the slightly spicy beef with the crunch and tang of the gherkin is hard to beat. They can be made with either white or wholemeal sandwich bread. Main ingredients: Sandwich bread, beef pastrami, gherkin, homemade zucchini pickle, tasty cheese and spinach leaves. 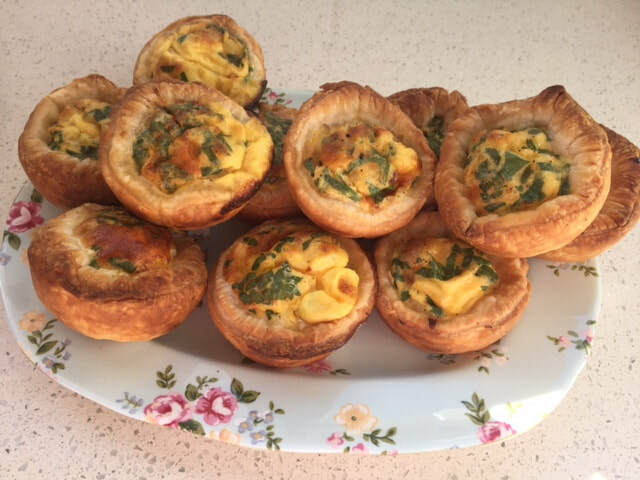 ​These muffin sized tarts have a puff pastry casing which is filled with tasty fried onion and bacon, herbs and an egg mixture. They can be served warm or at room temperature. They are very generous in size. Main ingredients: Flaky puff pastry, bacon, onion, egg, milk, salt, pepper, parsley. ​These are always so popular at any gathering. I use a combination of free range beef sausage meat and beef mince. I am extremely careful of the meat we use and where it comes from. 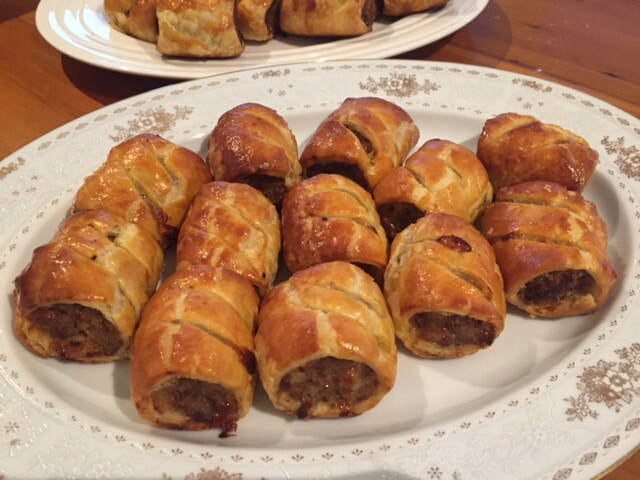 This is why many of my clients say "These are the best Sausage Rolls they have ever tasted". They can be served warm. Each sausage roll is 5 cms long and 3 cms wide. ​Main ingredients: Free range beef sausage meat, premium beef mince, flaky puff pastry, wholemeal breadcrumbs, mashed seasonal vegetables, salt, pepper, sweet chili sauce, tasty cheese, chutney and egg. 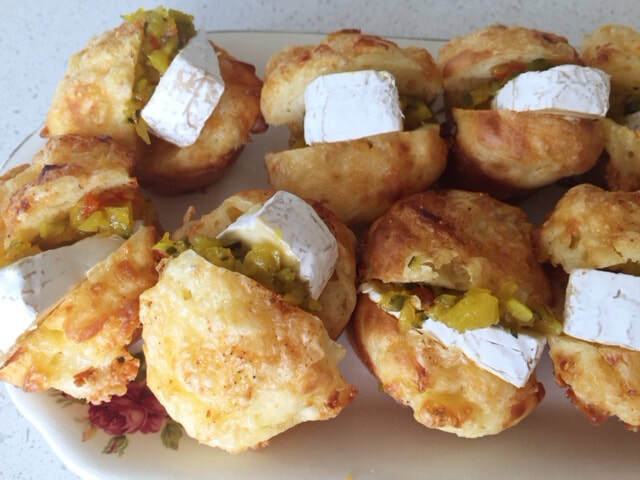 These easy to eat morsels are delicious and satisfying. The toppings may be ordered to suit the occasion or a combination can be prepared. The toppings include: Salmon and Herb Cream cheese; Blue Cheese (Castello) and Quince Jelly, or Brie and Zucchini Pickle (pictured above). The above topping can also be put onto homemade crostini's. There are a variety of scones on offer. You could have a plain Cheese Scone, which are always popular. Or you may have a Cheese and Bacon Scone which are truly delicious. 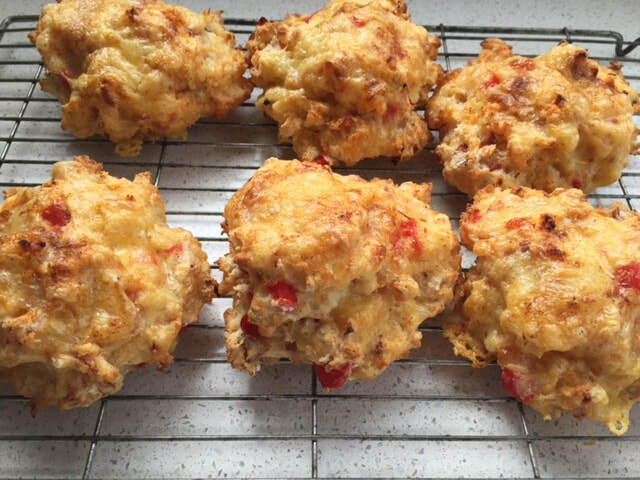 Alternatively, you could have a Cheese, Capsicum, Bacon and Onion Scone. The large scones make an ideal lunch option. We are happy to offer a variety of combinations. We can also cater for gluten free requirements. The mixture can be made into 6 large scones or 12 smaller (a good three to four bites) sized scone. 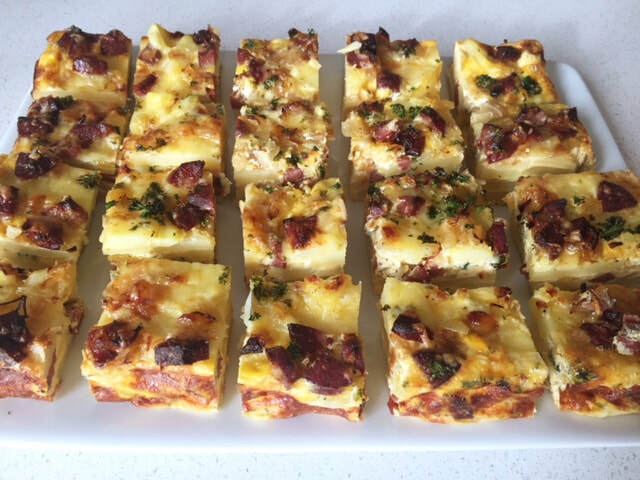 ​Main ingredients: Flour or gluten free flour, cheese, milk, bacon, onion, capsicum. 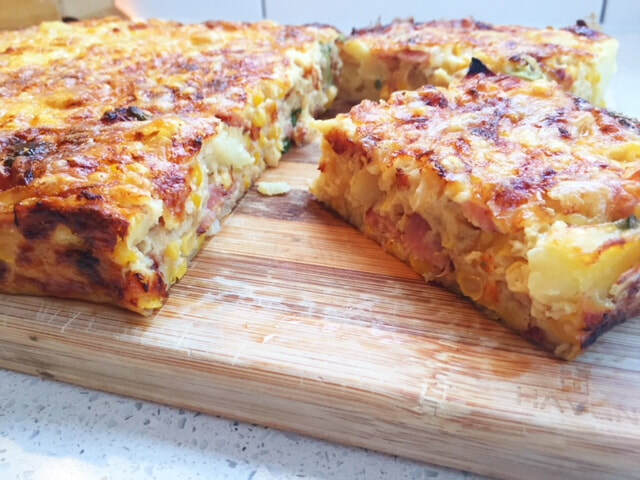 ​This vegetable slice uses vegetables that are in season baked in an egg mixture. Naturally, it is a vegetarian option. This is a good lunch option, but once cooled can be cut into bite size pieces to be eaten as finger food. Ideal served with a relish or pickle. Main ingredients: Eggs, cream, flour, onion, spinach, cheese, capsicum, grated carrot,olive oil, sweet chili sauce, pumpkin seeds and other season vegetables. These are medium sized cheese scones which have been filled with smoked salmon and zesty lemon and herb cream cheese. They are finished off with a sprinkle of pepper, herbs and the zest of lemon. These can be made gluten free on request. Main ingredients: Cheese, Flour, gluten free flour, milk, salmon, cream cheese, pepper, lemon juice, pepper, capers, chives, parsley and lemon zest.